Product #3394 | SKU AJA00085 | 0.0 (no ratings yet) Thanks for your rating! Miniature, low cost 1x6 3G/HD/SD Relocking Distribution Amplifier. 6 x separatey buffed SDI outputs - 3G HD-SDI,HD-SDI or SDI input, auto sensing. 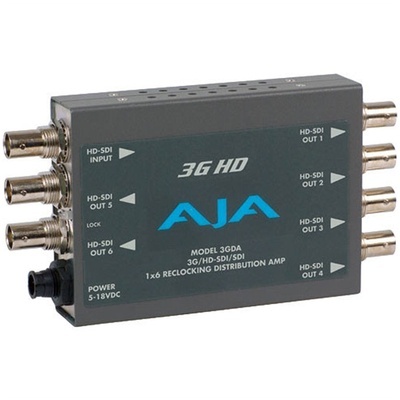 The 3GDA 1x6 3G/HD/SD-SDI Reclocking Distribution Amplifier from AJA accepts and automatically detects (1) 3G HD-SDI, HD-SDI, or SDI input signal and distributes it to (6) separately buffered outputs. Input signals are reclocked and equalized before being transmitted. All ancillary data in the signal is passed from the input to the outputs.